Scotland the Bread - Bread for Good Community Benefit Society Ltd. Soil To Slice is a participation project that runs alongside the crop research and the locally-controlled production of a grain and flour supply. In 2015, with support from the A Team Foundation, the Funding Enlightened Agriculture group and more than a hundred people who pledged more than £6,000 to a crowdfunding campaign, Bread Matters started the Soil To Slice citizen science project with the purpose of helping local communities to grow and bake their own healthy bread, from the soil to the slice. Seed from three of the Scottish heritage wheat varieties in Scotland The Bread’s research project — and support each community group through a year of growing, milling and baking. Small-scale equipment to sow and then to thresh, clean and mill the home-grown grains. Training and support for groups to host their own breadmaking session using their home-grown wheat. Advice at each stage, from sowing to baking, and collates the findings from each of the groups. In April 2016, the new Bread For Good Community Benefit Society (trading as Scotland The Bread) took over Soil To Slice. In May, the first Soil To Slice community growers gathered to share their experiences of growing heritage wheat, hear an update on Scotland The Bread’s nutrient research and get a little hands-on experience baking with some of the heritage flour. Read our blog post about the event. Granton Community Gardeners is a grassroots group of local residents in Edinburgh. They grow food on street corners, encourage gardening and host meals. The urban garden is spread across nine small patches of land. In autumn 2015, Granton sowed Scotland The Bread’s trial wheats (Rouge d’Ecosse, Golden Drop and Hunters) on 35 square metre plots, from which they harvested 42 kg of grain. Community groups in Glasgow (Locavore and the Concrete Garden) grew the same wheats. In 2016 Granton sowed 100 square metres of wheat; both years this was threshed at the Royal Botanic Garden Edinburgh’s Harvest Festival (see below). Read our case study on Granton Community Gardeners’ Soil To Slice experience here. During Spring 2016, the Edible Gardening Project in the Royal Botanic Garden Edinburgh and Inverleith Allotments joined the Soil To Slice project. Cyrenians Community Garden at the Royal Edinburgh Hospital, the 2000m2 project at Whitmuir Farm and Pilton Community Gardens with North Edinburgh Arts sowed their first crop in autumn 2016. All of the community-grown grain was harvested during September 2016 and 2017. Some groups had very small samples, which could be threshed by hand. Three groups threshed at the Royal Botanic Garden Edinburgh’s Harvest Festival event. Threshing #soiltoslice 2016 from Andrew Whitley on Vimeo. The threshing machine was commissioned from a UK company that usually exports machinery of this scale to Africa. Technology of the appropriate scale is an essential part of developing a fair-trade, locally-controlled short supply chain. Everyone who contributed to the crowdfunding in 2015, including all the bakers who joined in the ‘dough-sharing’, has played a part in providing the equipment and making this happen. Growing grain on this small scale in urban plots isn’t going to create a viable supply of flour for any community – although it’s worth remembering that a plot of just eight by ten metres can produce enough wheat to make bread for one person for a full year. However, even a tiny patch of wheat can change the way we think of our growing spaces and their connection with our food. This is a sourdough version of the Hot Cross Bun recipe from Bread Matters by Andrew Whitley. The process takes longer than the yeasted version, naturally, but the resulting buns are full of flavour, with a characteristic slightly chewy texture. Made with Scotland The Bread heritage wholemeal flour, they will taste all the better. The recipe below uses some white flour to make the buns a little lighter. The balance of flours can be adjusted to taste, bearing in mind that the more wholemeal used, the tastier – and more nutritious – the buns will be. In medieval days it was common for bakers to place a cross on their loaves, perhaps to repel any evil spirits that might infect the bread and prevent it rising. After the Reformation, such practices were frowned on as ‘popish’, but the cross remained as the symbol for the Easter bun. Rich, spicy, fruited doughs were allowed at holidays or public burials and by the seventeenth century the hot cross bun was established fare for Maundy Thursday. 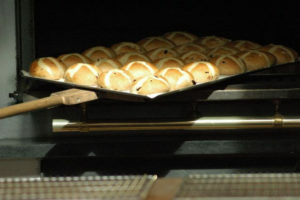 Until quite recently, people ate hot cross buns on just this one day of the year. Needless to say, supermarket culture has diluted such seasonal pleasure and hot cross buns now appear on shelves as soon as Christmas is over, if not all year round. Corporate marketing is adept at selling us re-heated morsels of our own history, for what is ‘One a penny, two a penny’ if not the original ‘buy one, get one free’? 12-24 hours before you want to make the Hot Cross Bun dough, soak a Fruit mixture and refresh your sourdough (if you haven’t got a sourdough starter on the go, see ‘Stage 1’ of this Bread Matters recipe here , but it takes a few days to build up from scratch). Refresh your old starter with flour and water as above. You can use all wholemeal flour if desired, but don’t use only white flour for this part because it’s lacking in the bioactive elements (natural yeasts and beneficial bacteria) that make a sourdough work well. Mix everything together into a smooth dough, then cover (a lidded tub is good) and leave in a cool place (not the fridge) to ferment. Put everything into a bowl with a well-fitting lid or a strong polythene bag, tie its neck and swirl it around a bit so that the liquid comes into contact with all the dry ingredients. Do this a couple of times over the soaking period if possible. Mix all together and ferment for about four hours. The mixture should be bubbling a little and should be fairly runny. Add the flour, spice, salt, egg, sugar, butter & water (but not the fruit) to the production sourdough and mix until everything is combined well. Knead (or mix in a machine) gently for as long as it takes to develop a soft, fairly smooth dough (the smoothness will depend on the proportion of wholemeal flour in the mix). Scotland The Bread flour has a softer gluten that doesn’t require much kneading. Add a little extra water if the dough becomes too stiff. It must be very soft at this stage. The dough will be tacky on the surface because of the sugar and egg in the mix, so use water on your hands and the worktop to stop it sticking too much. If your dough feels too soft and sticky to handle, it is probably about right! Put the kneaded dough in a bowl, cover well and leave it for 30 minutes or so. It won’t show many signs of rising in this time, but the gluten will relax which makes folding the fruit in much easier. Stretch the dough gently out on a lightly floured surface into a rectangle about 25 cm (10”) x 20 cm (8”). Spread the soaked fruit mix over almost all the surface. Roll the dough up carefully, turn it through 90 degrees and roll it gently up again, taking care not to force the fruit through the surface (easier said than done). Divide into pieces weighing about 80 grams each and, using a little flour on your hands and if necessary on the worktop, mould them into fairly tight, round buns and place them in accurate rows on a baking tray with a 2.5 cm (1”) gap between each bun. Remove any fruit exposed on the top of the rolls and tuck it underneath so that it doesn’t burn and become bitter. Prove until the buns are almost touching. This may take four or five hours, depending on the vigour of your sourdough. Be patient and remember that the natural sourdough yeasts are struggling with elements (butter, egg, spice, even the extra sugar) in the mix that make life difficult for them. more than 3 mm across) from the corner of a stiff polythene bag and improvise your own piping bag. Then pipe the crosses onto the buns as neatly as you can. Put the buns in the oven immediately after piping the crosses. Bake at about 180°C/350°F for 10-15 minutes depending on your oven. Glaze generously as soon as the buns are out of the oven with a mixture of two parts warmed honey to one part whipping cream, thoroughly stirred. Serve slightly warm and in the company of others. To celebrate Real Bread Week 2019 we organised a ‘flour share’ event with some of Scotland’s most talented bakers. The three bakeries that took part are all masters of their sourdough craft, committed to slowly fermented, flavour-full Real Bread. We sent them a sample pack of our heritage flours, in return for honest feedback. Scotland The Bread flour is lower in gluten and therefore ‘softer’ than conventional bread-making flour. It handles differently, requiring a delicate touch and less kneading than bakers are used to. Our bakers rose to the challenge, experimenting with it and producing beautiful loaves. Archipelago Bakery can be found on Dundas Street in Edinburgh’s New Town. Director Caroline trained on a Professional Bread Making Bread Matters course with Scotland The Bread co-founder Andrew Whitley, and now her bakery and café serves up bread and cakes, as well as a café lunch menu and wholesale baking. Archipelago uses only organic flour, and Caroline asked for Golden Drop to make a Real Bread Week loaf with, and also Hunter’s for a wholemeal carrot cake. Freedom Bakery is a commercial bakery with a difference: it’s a social enterprise that believes that people at risk of committing crime can benefit significantly from professional training and employment opportunities. Freedom Bakery was established in 2015 at HMP Low Moss. It started life as a small bakery within the prison walls, training inmates and wholesaling to cafes and restaurants in Glasgow. In 2016 Freedom made the decision to expand. Almost a year later after a successful Crowdfunder road and major investment from Resilient Scotland, a new, purpose-built bakery was opened in Glasgow. They continue to work with prisoners from Greenock, Barlinnie and Low Moss prisons who come out to the bakery on a training programme on day release. Where possible Freedom actively seeks to offer employment to apprentices after release, and where this isn’t an option they work with a number of partners to assist them into employment. The Bakery is committed to Real Bread principles, including using neither preservatives nor additives. They specialise in slow fermentation bread with a minimum 20 hours given to doughs, and use Scottish flour sourced from farms as far north as Orkney and as far south as East Lothian. He continued: ‘The formula we used for the bread in the photograph was 75% Rouge d’Ecosse, 8% Strong Organic White (Mungoswells), 17% white organic mother. The hydration is 77%. ‘The flour is quite weak in strength and it took longer to prove than our usual wholemeal flour (again from Mungoswells) but it baked really well. The flavour is amazing with warm, earthy notes. The crumb is lovely and with quite a soft texture as is the crust which caramelises nicely. It’s great in fact! Aliona Eardley runs The Riverside Bakehouse, a small bakery and cafe located in the rural hamlet of Abbey St Bathans in the Scottish Borders. Everything is handmade: they produce small batches of slowly fermented sourdough bread, a range of beautiful cakes and pastries, as well as seasonal soups and salads with a focus on local produce. Aliona used Rouge d’Ecosse flour in her test bakes. ‘The flavour of the loaf was superb, really gorgeous earthy notes,’ she said. On the 25th September, immediately preceding our AGM, we started what might well be the first ever community science experiment of its kind: a ‘People’s Plant Breeding’ grain selection event. For at least the last fifty years, grains have been hybridised in the lab to satisfy a strictly limited set of criteria – namely yield, pest resistance and suitability for industrial processing. This misses out on the vital genetic diversity that harnesses the adaptive, evolutionary power of nature, as well as flavour, nutrition and any consultation with the end ‘user’ – the baker and the eater – as to what they want from the end product. We have set out to test the hypothesis that we can democratise, preserve and perhaps even improve genetic diversity, as well as showing how ordinary people can contribute to public science (which belongs to us all) by helping to conserve agro-biodiversity. It is the view of Hans Larsson, a plant breeder from the Swedish Land University with 40 years’ experience of selecting cereals and the supplier of some of our heritage grains, that the best looking plants are also likely to be the most nutrient-dense. With this in mind, an experiment was devised to select and test spikes of grain based on the aesthetic judgement of the non-professional but enthusiastic lay person. The event was held at the Botanic Cottage at The Royal Botanic Garden Edinburgh, and our thanks go to them for hosting us. This event was limited to Scotland The Bread members and our Soil to Slice groups, and began with an introductory talk on the theory of the project from Andrew Whitley. Ten sheaves of Scotland The Bread wheat and rye, recently harvested from Balcaskie Estate, were displayed for our participants to then select their choice of the five most beautiful spikes from each of their two assigned sheaves. Allan went on to explain that we should be looking for symmetry in the spike, indicating that all the grains in the spikelets are well filled and not shrivelled or diseased. He also pointed out that the middle third of each spike would probably be where the best grains are – just the sort of expert information that citizen plant selectors need. The experiment will continue in the new season by growing on the selected grains, and hopefully raising the funds to test them for nutrient levels in the laboratory. If beauty and health are connected, which they probably are, we will discover whether the new ‘landrace’ or people’s selection is in fact more nutrient-dense, tasty and digestible when compared to the ‘mother crop’. And we’ll check whether this selection process conserves the great diversity within our crops that is their hallmark and guarantee of chemical-free resilience. By microscopic examination, by growing on grain and then by baking bread together, we will see whether we have improved, maintained, or reduced the genetic diversity of the grain and its breadmaking quality, flavour and digestibility. In this way, we will assess whether the suitability of a landrace to a particular soil and climate can be judged by the beauty of individual stalks, and genetic diversity improved by selecting and growing grain on this basis. Once learnt, this simple methodology could also be adopted by our Soil to Slice projects as part of the ‘citizen science’ that has always been one of Scotland The Bread’s purposes. We are beginning to open up plant breeding to the ‘genius of the crowd’, always assisted by the descriptive power of molecular biology. Animated by a sense of place (these plants are growing in Fife soil and are being stewarded by a Fife community), we aim to be midwives to modern landraces and at the same time to demonstrate a process that could be adopted by groups all over the country as we seek to change our food for good. We are also be helping to conserve agro-biodiversity in situ, not least because such diversity is hard to maintain in tiny gene bank samples that only see the light of day when they are grown out in small plots. Hans Larsson is of the opinion that if he gives away grain that is then grown on for three seasons, the resulting crop becomes a new landrace: the soil conditions and unique properties of that particular location will have so influenced the grain that it can now be considered – and named – a new variety. In this spirit, members of the Granton Community Gardeners brought a sheaf of their Soil to Slice wheat (Rouge d’Ecosse) to include in the selection event, and the prize grains to be grown on in their community gardens. Some was also taken by our newest Soil to Slice group, Forth Environment Link, to grow in Falkirk High Street. The resulting unique landraces will thus add the diversity of their locations to the genetic mix. The results will have to wait for a whole new growing season – this experiment is nothing if not an act of delayed gratification! Scotland The Bread has recently grown 70 tonnes of wheat and rye on the Balcaskie Estate in Fife. There are 10 ‘varieties’ which, with the exception of one modern spring wheat Paragon, are characterised by considerable genetic diversity within the crop. This is especially true of the ‘evolutionary varieties’ that we have brought over from Sweden. For example, Hans Larsson created his winter ‘Fulltofta’ rye from at least ten different varieties from as far afield as Greece, Estonia and Finland as well as Sweden. Many of these component varieties are, in fact, landraces, i.e. diverse populations of grains that have become adapted to a certain place over many years of growing and farmer selection. Modern (post-1900) hybrid breeding proceeds by crossing two varieties and selecting only the progeny that expresses the desired traits to the greatest extent. This narrows diversity to the point that in a typical commercial variety every plant in a field is genetically identical. By contrast, cultivating diversity harnesses the adaptive, evolutionary power of nature. In simple terms, the plants that best adapt to a particular soil and climate and best survive the various stresses of weather, pests and diseases will, over time, dominate the mixture. There is reason to believe that both yield and nutrient density are stabilised, if not enhanced, in this process. The question arises: should the modern custodian of a landrace or ‘evolutionary variety’ simply re-sow a random selection of seeds from this year’s harvest and trust nature to do the rest? Or can we emulate the practices of millennia of grain growers in somehow ‘improving’ our landrace without inadvertently narrowing the very diversity which is a guarantor of health and a reliable yield? We suggest that we can ‘democratise’ plant breeding and selection by involving the people who pay for and eat the end result. This isn’t to reject the advances in molecular biology that have transformed our detailed knowledge of plants in recent times. Far from it: we need the experts and their spectroscopes to tell us what we’ve got. But deciding what we want from our grains – in the field, in the landscape, in our economy, in our guts, for our souls even – is a process that would surely benefit from the appropriate application of our collective wisdom. After all, the ‘market’, dominated as it is by a small number of inevitably self-interested corporate actors, has presided over the gradual diminution of nutrients in our grains as well as an evident growth in allergy, intolerance and digestive discomfort. Public health in Scotland is not well served by monocultures, agronomic or economic. If diversity in soils and stomachs is increasingly taken for granted as essential for healthy function, it surely makes sense to apply the same principle to the crops we grow and the way we breed them. Read on here to find out how our experiment – our small, quiet and entirely benign revolution – is being carried out. The second Scottish Bread Championships was held at this year’s Royal Highland Show, attracting more than 80 entries from across Scotland. Judging took almost four hours, with eight of the country’s keenest food experts poring over a laden stretch of table before the awards were collated. Organised by the Scottish Food Guide and Scotland The Bread, the Championships are made up of seven classes, open to professional or amateur bakers of any age submitting entries meeting Real Bread Campaign criteria (bread made without the use of processing aids or any other artificial additives). Loaves are judged to Gold, Silver and Bronze standard, with a Supreme and Reserve Champion also awarded. The stunning display of bread laid out for the judges was made up of loaves of every shape, size, colour and pattern: a testament to the wonder of possibilities created by a few simple ingredients. Judges were given a workshop in fair and meaningful assessment of the categories by Andrew Whitley of Scotland The Bread and Bread Matters before breaking off into pairs for the serious business of smelling, tasting, crust-testing and ingredient-examination. We were struck and encouraged by the number and range of entries baked using Scotland The Bread’s heritage flours, from tin loaves to rounded boules. Wild Hearth Bakery’s trio of loaves made with 100% of each of our three flours – Hunter’s, Golden Drop and Rouge d’Ecosse – sparked an enjoyable interlude in judging for a comparison taste test, with a noticeable difference in flavour between the three. Congratulations to all those awarded, and a warm thank you to all of this year’s entrants: every loaf on the table contributed to this fantastic celebration of the best of Scottish breadmaking. Scotland The Bread recently launched three own-brand flours made from historic Scottish wheats that are being registered as Conservation Varieties. The Community Benefit Society has thus far been based at Macbiehill Farmhouse (near West Linton), which is also the home of Andrew Whitley who, with STB co-founder Veronica Burke, has for some years been a prominent promoter of healthier bread produced in more sustainable and locally controlled ways. Scotland The Bread is moving into the next chapter of its story: we are currently planning to move its main operations to the Bowhouse at Balkaskie Estate in the East Neuk of Fife. This is to allow the scaling up of flour milling and related activities and generate the operating surplus that will allow us to address the other aims of the Community Benefit Society. Ten hectares of winter wheat and rye have been sown at Balcaskie Estate and a further nine hectares of spring varieties will bring an expected total of 50-60 tons of milling grain for the period September 2018 to August 2019. We are therefore looking for a Miller-Manager to oversee the milling, handling and marketing of this harvest. The full job description can be found here (PDF) – please circulate it to potentially interested parties. The 1800 hectare Balcaskie Estate, owned by the Anstruther family, comprises a mixture of let and in-hand farms and is “committed to cultivating and caring for the natural environment, nurturing local business and supporting the vibrant community”. The wide variety of land and soil types supports an equally broad range of farming activities including potato, vegetable and cereal growing, and livestock breeding and fattening. The land on which Scotland The Bread grains are growing is organically certified and much of the Estate is undergoing organic conversion. The Estate is a pro-active member of a number of collaborative initiatives, including Food from Fife, a non-profit organisation promoting food production and food tourism in Fife. To improve the ‘field to fork’ supply chain, the Estate has converted the Bowhouse as a collection of production units and a covered market space for producers and consumers.